“Then it seemed like falling into a labyrinth: we thought we were at the finish, but our way bent round and we found ourselves as it were back at the beginning, and just as far from that which we were seeking at first.” This is how Plato used the image of a labyrinth to describe the quest to develop a logical argument. From ancient to medieval to modern times, labyrinths have captivated the human imagination. Now, thanks to professor Phil Adamo and the students in his “History of Labyrinths” summer course, Auggies and passers-by can experience the same angst, or perhaps peace and tranquility, as Plato and his students may have in wandering a path or constructing an argument. Adamo’s class toured labyrinths in the Twin Cities metropolitan area, including one at the Wisdom Ways Resource Center for Spirituality at the College of St. Catherine in St. Paul. In addition to exploring the history and studying the vocabulary of the structures, students discovered that the best way to learn about something is to do it. Throughout the six-week course, they sketched a design, plotted it on the ground, laid sod and a pebble path, placed pavers, and planted a border. Their final project was to design and place a public history sign at the entrance. Delaney Ryden, senior medieval studies major, said she was surprised to learn of the religious aspect of labyrinths. Her most significant lesson, however, was that such a project involves a great deal of manual labor. “I learned that when you are going to build a labyrinth, ideally you have slaves. Lots of them,” she said. Augsburg’s labyrinth is located on the west side of campus adjacent to the community garden. Students designed and constructed the labyrinth not only as the final project of their class but also as a gift to the college and the neighborhood. 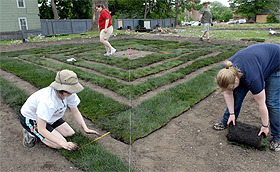 Delaney Ryden, Suzanne Stenson O’Brien, Matt Raatz, Ruth Senum, and Kenra Fleming designed and constructed the labyrinth, and funds were provided by the Augsburg Goliard Society. In ancient times, the labyrinth was a puzzle, having no obvious path and including many dead ends. This multicursal maze was used to confuse and trap the wanderer or malevolent spirits. In medieval times, labyrinths were used to symbolize a path to God. The modern labyrinth features a unicursal design — one circuitous path leading to the center and back to the beginning. Today they are often used for meditation or prayer and are believed to promote healing. Every year, thousands visit the famous Chartres Cathedral labyrinth in France and others at churches and parks throughout the world.